I want to reuse the structure of a database in a new project. So using SSMS I use Generate Script and in settings I set to generate schema only. In the result there are too many queries about extendedproperty. Is there any important data or settings in these queries or I can completely igonre them and only reuse queries on database tables and fields to start a similar project? And if they ar unnecessary how can I use "generate script" without them? DBA's and developers can use extended properties to save information about database objects. If you're scripting other dba's objects you could loose information about them. Extended Properties can be created for the below database objects, but in this tip, we are going to focus on column level Extended Properties. Specify a caption for a table, view, or column. Specify a display mask for a column. Display a format of a column, define edit mask for a date column, define number of decimals, etc. Specify formatting rules for displaying the data in a column. Describe a specific database objects for all users. Not the answer you're looking for? 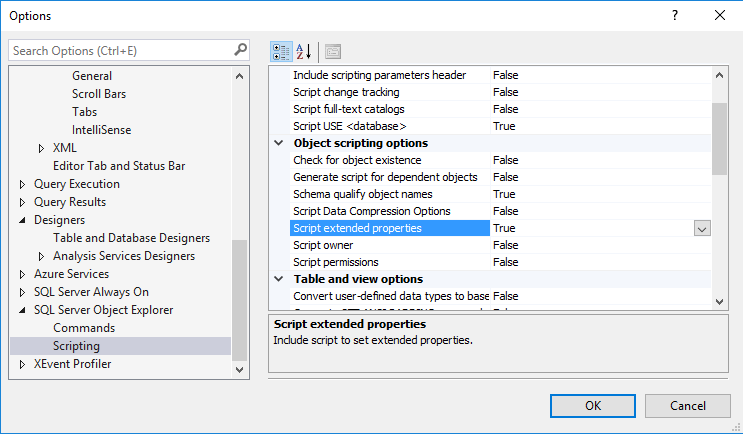 Browse other questions tagged ssms scripting schema-copy or ask your own question. Can you set the output configuration at Query time?